If there is one day which is unforgettable for children it is their birthday. Excitement rules during the days leading up to the big day. Monte Igueldo is the best choice for holding birthday parties for your children, who will have a great time with their friends in one of the city's most iconic locations, where they will enjoy an unforgettable day. Return ticket on the Funicular. 4 attractions to choose depending the age of the kids and the availability (the attractions must be the same for all the kids of the group). Snack in the Gastro-Bar “El Karrusel”, which is composed of two sandwiches, chips/snacks, water/soda and a chocolate cupcake. The Price of the token is 16,5 € per kid (VAT Included). You can add more attractions to the birthday token at a rate of 1,60 - 2,00 €/attraction. A reduced return ticket rate will be apllied to the adults accompanying the birthday kids on the Funicular. The plan is designed for the group to be autonomous and move around the park without monitors. Here you can fill out a form with the date you would like to celebrate your birthday and the attractions you would want to ride (if you don’t recognize them, you can take a look at the “Attractions” section of our web or we can make you a proposal that fits the size and ages the birthday guests). The minimum children numbers to organize a birthday is 6. In case you want the kids to ride in more than 4 attractions you should indicate it in the “commentaries” section. It is required at least 6 kids and a minimum of 7 days to confirm the reservation. In case of bad weather forectast there are two options: postpone the celebration (the decision has to be communicated 48 hours in advance) or go on with it and change to attractions that are covered from rain.. It is not allowed to acces the Gastro-Bar with any kind of food/beverages. The birthday token is to be paid and picked up in the Funicular lower station the day of the celebration. (Cash payment). We usually recommend using two attractions first, then the snack and finally the two remaining attractions.. The birthday estimated duration is 2.5 to 3 h. Depends somewhat on how fast you do attractions / games and what it takes to snack. We therefore recommend that the end an attraction that gives much play and has no time limit, as is the Great Maze. We also often include a game of skill (may be the turtle race or Scalextric, for example) because it is played in rounds and that makes time to lengthen. 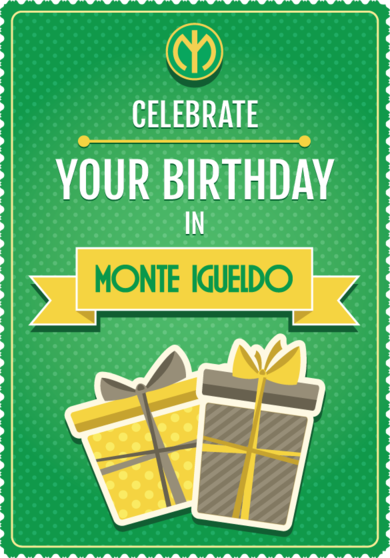 If you want to organize or celebrate another event in Monte Igueldo, contact with us using this contact form.